We all dig ruts for ourselves, routines and activities that shape our days and give us a sense of control over chaos. Some of us dig deeper grooves than others. We rise at the same time each day, eat the same food for breakfast, drink the same juice and coffee and read the paper in exactly the same way. We walk the dog at the precise time each morning and take the same route to work; and lunch and dinner follow like clock-work, punctuated by the arrival of the kids home from school after the clock hands have spun enough times. I’m one of those people. Every morning at the bus stop, I throw the ball for the dog. She races after it and always returns on the same path. The grass under her feet is worn brown. I’m like her. Each morning the ball is thrown out, and I carry it back along the routes I know. I’m at a time in my life where major changes face me. My parents are elderly, my children are teenagers on the brink of finding their own lives. My former career is gone, my new one uncertain. The economy and old political orders and even the weather seem to be shifting to new patterns. So I cling to my routines, clutching the ground with my fingers and toes and hoping for one more day before I’m flung from my rut. But once in a while, someone or something forces us from our path. Sometimes it’s something big—the loss of a job or income, a health crisis, the death of a loved one. And sometimes it’s something small, like snowshoeing in the woods on a winter day. My husband signed us up for a ranger-led hike at Snoqualmie Pass in the Cascade mountains last weekend. Secretly, I fretted about going. I’d have to get up early. I’d need to find snow gear. I don’t know how to snowshoe anymore. Even though I grew up in the snow on the Canadian border, I haven’t donned skis or snowshoes in decades. Snowshoeing isn’t routine. But we went. 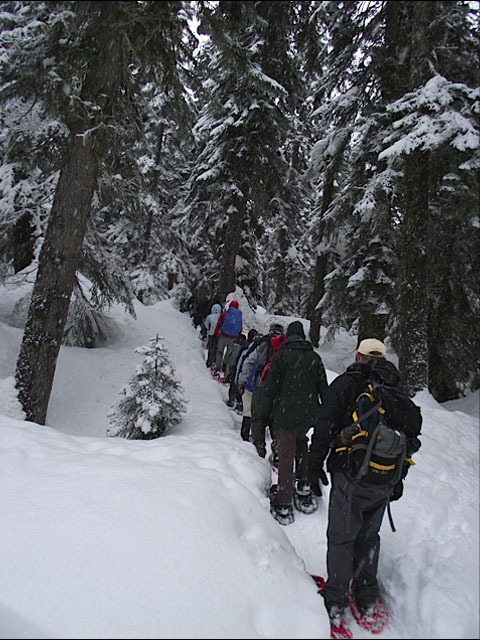 The rangers handed out snowshoes and led us onto the snow field where the hike would start. I stared around amazed. 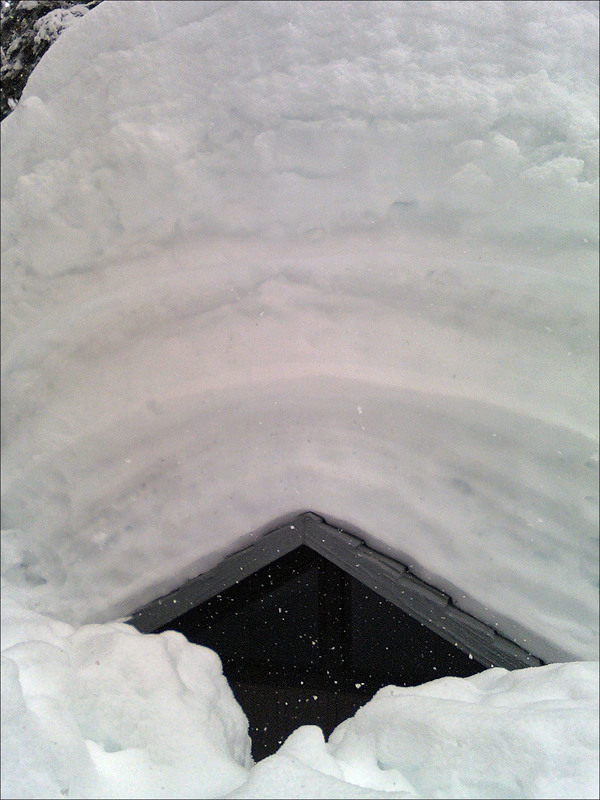 The snow, where it was cut back along the road, rose higher than my head. Once on top, people occasionally broke through the surface and plunged up to their hips. We stood on a parking lot, said our guide, and we’d start our hike along a forest road. No trace of it existed. Now only a tamped down, two-foot wide track led through a white meadow. A bathroom sat buried at the end of the lot with only the tip of its roof showing. Snow fell gently. Once we got our snowshoes on our feet, our guide lined us up along the field and told us we were going to race to the outhouse. He blew a whistle and I lurched forward with everyone else, moving like a giant Arctic waterbug. The lady next to me fell onto her face and floundered helplessly until a ranger plucked her from the snow. I kept going. Another person fell. I strode forward, following a guy with six-foot legs, and exhilaration began to grow. I didn’t beat spider-man, but I kept the feeling and stayed on my feet. I saw new perspectives: A tiny bush poking from the snow in reality was the top of a 15-foot tree reaching for the sky. Land that would be impassible in summer because of thorny devil’s club and brushy swamp was easily negotiable on a bridge of snow. The world was white instead of green. I was forced to move in a different way, bringing my feet level along the snow, and digging in my toes on the inclines to keep from slaloming down. I forgot to care if I fell down or looked odd. And I was reminded of all the world that waits to be explored and the interesting people still unmet. The hike wasn’t long, only ninety minutes through the snow. But it led to new possibilities I never would have considered on my usual path. So maybe we should all force ourselves to do something new each day or week. Eat a new food or read a romance or a book on pi, take our dogs on a new trail or say hello to someone we don’t know. Read a new blog or try a different video game or listen to country western. Try karate or dodgeball or tennis (I draw the line at Zumba). Learn how to program a computer or play the banjo. Plan a trip out of the country or explore a nearby town. Sure, we might fall on our faces and flounder until someone helps us up. But we might see something beautiful. Change comes whether we hide or not. Our ruts may be comfortable. They may give us a sense of security and a clear path of where to go. But if they get deep enough they become blinders, obscuring our vision and keeping us from seeing all the possibilities in life. Let’s see if we can break free.